You guys probably know by now how much of a lipstick fan I am! I just made a "lipstick-related" tutorial just this morning right? I started my love for make up with trying out various lipstick shades back when I was in college as I was so scared to do anything on my eyes! It was then I knew how lipstick could change the way I look and feel. And truth be told, even as a busy mom, whenever I go out, I tend to reach out for lipstick to make myself feel and look better. That's when I understood how lipstick can make a woman feel confident and ready to face the world! Really, with just one swipe, I felt like my whole outlook for the day is a tad bit better. That's why when I got a note that SM Beauty will be celebrating International Lipstick Day on the 29th of July with loads of discounts on various lipstick brands --- I knew I had to let you guys know! What to expect on that day? Brands like Shiseido, L'Oreal, Revlon, Max Factor, NYX, Maybelline, Ever Bilena, BYS and others are offering lip makeup services and discounts up to 50%! Some promos will run from July 23 to August 26th while others are only on that SPECIAL DAY! 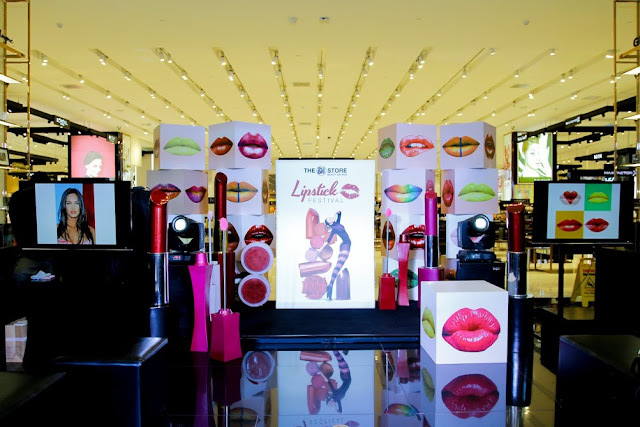 Aside from that, SM Makati shoppers can also see the latest lip trends from luxury brands like Dior, MAC, Clinique and Shu Uemura are also included in the list of wide arrays of lipsticks to choose from! If you are planning to look for that perfect "casual day lips", "Work Day Lips", "Date Lips" and a whole lot of adjectives for the lips! Visit SM so you can mix, match and experiment with different brands of lippies like we Beauty Bloggers do every time we visit the Beauty Section of SM. And before I end this post, I want to share some good news! ONE lucky AMW reader can win Php1,000 worth of SM Beauty Gift Certificate (perfect to use on that day when you shop for your favorite lipstick brands!). How? By logging on to your Instagram accoung and show me your best #SMLipfie! Post a selfie wearing your favorite lipstick. Make sure your account is public so I can check out your photo. Contest runs from July 27 to July 29. Winner will be announced on July 29 after 12nn. The winner will be notified on her entry photo. The GC will be shipped by yours truly. What are you waiting for? Show me your #SMLipfie and I can't wait to LIKE it!